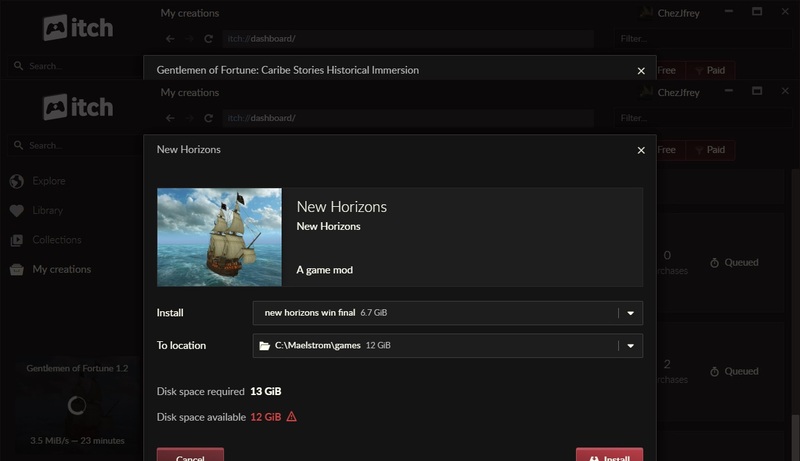 Pirates Ahoy's own New Horizons game mod running native on Buccaneer’s Reef Maelstrom Engine. Start playing it in the improved engine with no crashes and far improved graphics. PARTICIPES NOS GRATIS. The mod ”RESOURCE” content offered DOES NOT belong to us and we make absolutely no claims to it. In addition we are not the support for it and questions on game content or how to play it should not be made here, but to Pirates Ahoy! We are also not interested in – nor will we ever – mod or add content to New Horizons – as we are not its developer; we didn’t build it and we are not its home. NOTE: This piece is incomplete; the skies and some particle effects still need adaptation to the newer engine. But, save for one member at Pirates Ahoy! there has been lack of interest in this adaptation. While this is playable, it is not entirely an accurate representation of the New Horizons mod, and if you would like that, hit them up at their forum and let it be known you would like them to finish the adaptation to the newer engine; at one time, that endeavor was desired among their forum...not sure why when it became available with our Maelstrom and ported scripts were provided them, that desire suddenly vanished.